Sony can finally breath easy. For a second or two. 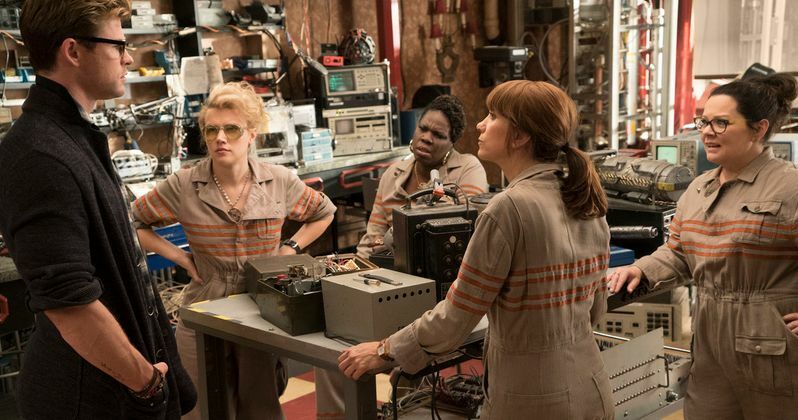 It appears that the new Ghostbusters remake will not be a bomb as many expected. The movie's opening day box office has set a new record for both star Melissa McCarthy and Director Paul Feig. But that might not be good enough for what the studio considers one of its tentpole titles. An umbrella they plan to make movies under for infinity. Perhaps that won't happen quite as planned. Sony and Village Roadshow are now predicting a $46.5 million opening weekend for this new Ghostbusters, which also stars comedy heavyweight Kristen Wiig along with first time feature film headliners Kate McKinnon and Leslie Jones. The movie pulled in $16.9 million on Friday, winning that day at the box office. If the movie does, in fact, pull in what is expected, it will easily beat Feig and McCarthy's current highest opening weekend gross of $39.1 million, which came with 2013's The Heat, which had the added star power of Sandra Bullock. The Ghostbusters budget is projected to be $144 million by Deadline, after rebates and before an additional $100 million+ in global marketing. Rivals speculating on Ghostbusters' box office claim that anything that falls within the $40 million range should be considered mediocre at best for the summer blockbuster. Pulling ahead of $50 million is considered safer for the franchise restarter. But one non-Sony executive had these encouraging words. "It's not a bomb. A bomb would be an opening in the $20M range. However, a start such as this really puts more pressure on overseas delivering." One problem Ghostbusters could be facing is the fact that it won't open in China. At least not right now, and the country served as a saving grace for the lackluster debut of other recent franchise reboot Terminator Genysis. The global Ghostbusters release is staggered, with English speaking countries getting it this weekend alongside Brazil. Russia and Japan will be bestowed with the supernatural comedy two weeks from now. The global box office not being what it is today back in 1984, the original Ghostbusters didn't have much of a presence overseas. And none of Feig or McCarthy's past comedies have generated big box office outside of the U.S.
Sony is said to be quite happy with the opening day box office, and the fact that the movie is heading towards a mid-$40 weekend. And it's still early, when the dust settles on Monday morning, it's still possible that the movie will have pulled in north of $50 million. Ghostbusters currently has an A- CinemaScore with the under 25 crowd, generating a B+ with all general audiences. This is the same grade bestowed upon Feig's Bridesmaids and Spy. The movie has also generated a 73% fresh rating on Rotten Tomatoes. This helped raise opening day numbers, which were original speculated to hit at just north of $30 million. Also in Ghostbusters' favor is that it was the only major wide release this weekend, going up against last weekend's surprise hit The Secret Life of Pets. As it stands, many are speculating that this new Ghostbusters could end its theatrical run with north of $150 million, which will make it a substantial win for Sony. And it definitely means we'll be seeing more of the lady Ghostbusters in the future.